"Long's star continues to rise with each new emotionally powerful, wonderfully rich novel. Incorporating the perfect depth of emotion into a romance rich in passion and character, she creates memorable love stories. Even a tried-and-true captive/captor plot feels new in her capable hands." Hoo boy, eh?? That's exactly the sort of energy boost I need to push me over the deadline finish line. :) Also, Cherokee Sanders at Coffee Time Romance said it's a "fast moving story that just engulfs the reader with every page...Colin and Madeleine are a dynamite duo and their interactions are fantastic." And Marilyn Heyman at Romance Reviews Today called it "Well paced, romantic and suspenseful, with underlying sexual tension...THE PERILS OF PLEASURE should go on your must-buy list." If you guys stumble across any other good early reviews, send 'em my way. :) Sometimes reviewers send them to me, and other times I sort of happen upon them later, but I'd love to link to them in my newsletter, etc. if you find any. And if you stumble across any "eh" reviews, please keep them a deep, dark secret. LOL. 1) Are you guys aware of the Jane Fest happening on Masterpiece Theater on PBS?? OH. MY. is all I can say. I heartily approve of this entire gallery of heroes. Good calls casting-wise, all the way across the board. I think Captain Wentworth might be my favorite. Or George Knightly. Or... Boy, this is hard. Pick your favorite out and report back. LOL. 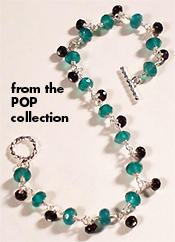 2) Circe Designs, a Northern California jewelry designer, designed a collection of handcrafted jewelry inspired by POP!! It's gorgeous. (That image up there is the bracelet). Circe tells me they'll send a free pair of sterling silver and Chalcedony earrings to anyone who makes a purchase of anything directly from their site using the coupon code "POP." I can vouch for the beauty and quality of it all. It makes me feel pretty, and Lord knows, by the time the end of a deadline rolls around, I need all the help with "pretty" I can get. OK, I have to go make tea, eat soup, and other author-y t hings. :) Tell me how you are when you get a chance! Glad to see you are doing well Julie! I gotta check out that kettle you mentioned, that sounds amazing and I like a whistling kettle too. Right now mine is slightly broken but usable and I am trying to decide between a bright, apple green or bright blue colour instead of the stainless steel one I currently own. Kudos on the great reviews but I am not surprised since you are my fave author right now. ;) Can't wait to read POP, it is supposed to ship to me the end of this month! Hey Charlene! Hope things are going great. Thanks for the congrats -- you're so sweet! Can't wait to hear what you think of POP. :) And you know -- I splurged on that teakettle in part because I've gone through about, oh, three of them in the last year. LOL. If they don't whistle I burn them eventually, and I've had a few non-whistlers I've burnt to a crisp. Not proud of that, but I've just come to accept it. LOL. Mostly it's because I'm generally doing around 2-3 things at once, and the teakettle is only on the periphery of my awareness, half the time -- I put the water on very quickly and sort of reflxively. And if I buy a less expensive one they rust inside quickly!! LOL. It's a science! I'm figuring it out. LOL. My new one is black -- I would have loved another color -- and I vote you go for the apple green, btw :) -- but the need was pressing, and at the store where I bought it they only had a bright red (which I loved, but which would have clashed a little with my circa 1930's old pink tile in the kitchen) bright yellow, white and black. So I went with black. :) And boy, that baby's loud! :) which is a good thing, as far as I'm concerned. Fact that may only interest me: Some study said Tulsa, which is about an hour and a half away from me, has the worst allergies in the nation. And my allergies seem to have gotten worse since I moved up here. I never had the vertigo before. So go figure. I looked at the gallery of men, and I wasn't sure who to pick, because I don't really remember my Austen very well, since it's been a good while since I read her. I remember Darcy, and a few others sounded vaguely familiar, but other than that, I had no idea. When are they showing these movies? I should catch up-about the only Austen movie I've seen is the Pride and Prejudice with Keira Knightley. Which I liked, although I have a friend who hates it and insists they took out entirely too much, and that the PBS version is the only proper one. It's like arguing over Bible translations, I think. I don't drink a lot of tea-perhaps I should. I'm a diet soda person. And occasionally Starbucks, but that makes me feel weird, especially if I'm super tired and drink it. Then I'm jittery and exhausted. I do like sweet tea, however. It's a Southern thing. I think that's why the South has such high obesity rates-all the good/fried food is here. Jules works for me!! LOL. It's either that or Jewels - depends on who you ask. :) That's interesting re Tulsa (is it because it's dry and dusty? poor air quality laws? in a valley with no wind?? ), and rough re the allergies, Lareign -- and your mom's right!! I'm kind of a a lightweight -- one of those people who take half or quarter doses of pretty much any med, like, say, Alleve -- so I try to avoid antihistamines. But I'm lucky in that a lot of natural remedies actually help me. Vicks and tiger balm have menthol, etc., which clears up breathing, and lavender oil is fantastic, too -- can wipe out certain headaches right away. I drink ginger (grated ginger, steeped) with lemon and peppermint tea for various other ailments, too. It all works pretty well. LOL. RE the Austen men -- I'm thinking, hey -- just pick your favorite face. LOL. Some are heroes, some are rogues in that gallery. All of them will be extremely pleasant to look at every Sunday night at 9 for a while. :) And actually, though I liked the most recent P&P a good deal (ESPECIALLY their version of D'arcy), parts of it bugged me a LOT. The dramatic conversation between the two of them with the swooning music in the rainstorm -- man, I was desperate to get rid of at least two of those elements. That scene is powerful without all the folderol (because of the dialogue and good acting), so the rain and music REALLY got on my nerves. Their Bingley was a bit of a dork. LOL. Other things, too. But I did love the movie, all in all. For me, just about any new Austen interpretation is welcome -- it's fun a pleasure to see re-imaginings, and live those stories again, and of coure analyze them to death! Diana!! Your'e making me jealous -- I want to see EVERY one of those movies!! I hope they're all still around when I come up for air in a few weeks. I'd love to see There Will be Blood because DDL is in it. :) We don't get to see enough of him. I'm afraid to see Atonement because it'll probably make me cry. LOL. A friend of mine is GAGA for No Country for Old men, though I hear it's very violent, and I'm a big wuss re violence. We've got more rain coming in on Sunday, according to Bill Martin on KTVU. LOL. Cold tonight, boy!! Ah, well. I've been loving the sunny days. Stay warm!!! Little Rock is 8. And I'm in between Little Rock and Tulsa. Eh. I think trees are a lot of it. And weird weather-the milder the winter, the worse the allergies, apparently. So I'm praying for a blizzard. San Fran, by the way, is 27. Just FYI. And the picture gallery is interesting, although at first I didn't know what kind of gallery they meant: Pics of people sneezing in front of say, the Golden Gate Bridge? Yeah I liked the Darcy in the most recent version, as well. He was nice and brooding. As for Atonement, I want to see it, but since I've already read the book...yeah, I know it'll be depressing. A friend said it made her want to slit her wrists. I kind of am averse to movie violence as well-at least a lot of it. I've heard Sweeney Todd is quite bloody, which, considering the plot, is to be expected. Not sure yet about No Country-it was playing here, now it's not, have no idea if it'll return post-Oscar nominations. Juno nearly made me cry a couple times, as well. And the ending really depressed the same friend who saw Atonement-I can see why she's depressed, but I thought it was OK, even happy. There was a plot twist or two that threw me off, in the best way possible.